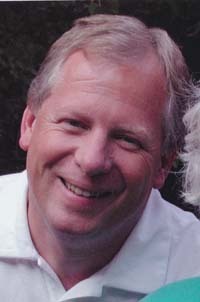 Peter Ives Ripsom, 61, died March 30, 2012, after a valiant 14-year battle with colon cancer. He is survived by his wife, Fran, and son, Tobias; brothers, David (Pat) and Jonathan (Marj) and sister, Pamela (Chris); nieces, a nephew and many friends. He was preceded in death by his parents and youngest son, Aaron. He was born in Garden City, N.Y., to T. Bleecker and Shirley Ripsom. Peter grew up in Pennsylvania and graduated from Ohio University. He was an architect and a member of AIA as well as the National Trust for Historic Preservation. His professional life back East revolved around preserving and reclaiming old structures. With his wife, Fran, he designed and illustrated "Old Allentown Houses," a design guideline for historic districts. It is still in print after 30 years. As much as Peter's life was filled with old structures and antiques, he embraced clean, modern architecture, often combining the old and the new. He collected contemporary art, loved to cook and savored a good martini. Peter always believed in helping people and giving back to the community. He served on the board of Compassionate Friends in the East and continued that work locally with Hospice & Palliative Care of the Wood River Valley. He served on Ketchum's Planning and Zoning Commission for seven years, also serving as chair. His community work also included a stint on the Ketchum City Council. Peter was an Eagle Scout and was active with the Boy Scouts his entire life. He loved to hike, mountain bike and most of all, ski. He will be remembered for his wit and zest for life by his family and friends. We know he's now sailing the heavens with Aaron, but those of us left behind on earth will sorely miss him. If you wish to make a contribution in Peter's memory, a favorite local charity is Hospice & Palliative Care of the Wood River Valley or a charity of your choice.